There were 1,925,146 background checks run through the National Instant Criminal Background Check System (NICS) in August, according to Federal Bureau of Investigation documents. That's an increase of more than 70,000 compared with the previous record set last year. August marks the second time in 2017 that a month has set a new record for gun-related background checks. May was the previous record-setting month. Though NICS checks have remained at or near historic highs in 2017, major gun manufacturers have still struggled to maintain sales levels they saw in 2016. Smith and Wesson's corporate parent recently reported a nearly 50 percent drop in firearms revenue compared with the same period last year. However, the number of NICS checks in a month is not an exact measure of gun sales in that month for a number of other reasons. 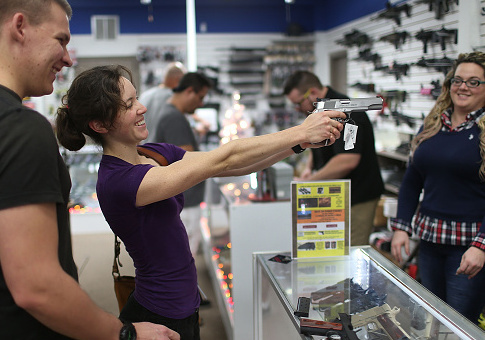 Most states do not require a NICS check on sales between private individuals. More than one gun can be sold during a single NICS check. Some states also use a NICS check during their gun-carry permitting process. "These statistics represent the number of firearm background checks initiated through the NICS," the FBI wrote in a disclaimer on its report. "They do not represent the number of firearms sold. Based on varying state laws and purchase scenarios, a one-to-one correlation cannot be made between a firearm background check and a firearm sale." The National Shooting Sports Foundation, the gun industry's trade group, said its own analysis of NICS check numbers revealed an 11.3 percent decline in checks related to gun sales over last year. In other months this year, the group's analysis reported sales were higher than the raw NICS check numbers indicate. Michael Bazinet, a spokesman for the group, said regardless of which measure you go by, checks "remain strong on a historical basis indicating the long-term growth we have seen in the shooting sports." "There are some real buying opportunities available for consumers as demand and supply come back into line," Bazinet said.